I first fell in love with barbecue when living in Texas. It was probably the first time I really had that perfect smell of what barbecue should have smelled like when eating at Sonny Bryan’s. The chopping away at ribs, brisket, or pork shoulder, piled onto a paper lined tray and served with legitimate sides, let’s just say I was in heaven. As we all know Texas is not the only place for barbecue, and as I have grown older (sigh), I’ve experimented enough with my smoker, and coming up with sauces to come up with some really great barbecue. But there is one thing that I really love when making barbecue, and that is burnt ends, and let’s just say that doesn’t happen all that often. I usually smoke things like fish, ribs, and pork shoulder, but burnt ends are the golden nuggets of barbecue in my opinion, and brisket is that source. With that said, I set out to smoke a brisket and get some burnt ends going. There are barbecue purists out there when it comes to brisket, among other items, but I went the route of seasoning overnight, and injecting right before I placed my brisket on my smoker. It worked really well, but I will let you decide. Start by adding a generous amount of salt and pepper all over the brisket. Place into a sealable bag and place in the refrigerator overnight. The following day, remove your brisket and let it come up to room temperature. During this time, add the beef stock and garlic powder to a sauce pan, and mix. Set one cup of the mixture to the side to be used later. Inject the brisket in a variety of places. Let it rest, and prepare your smoker. Once your smoker has come to temperature, add in a few chunks of your cherry wood, and place your brisket into the smoker. Cover, and take a rest. Add a bit more wood about 45 minutes into the cooking process. I like to smoke early and let it cook on low the remainder of the time. Adding smoke towards the end gets a little bitter in my opinion. Smoke the brisket until you have an internal temperature of 170 degrees, then remove and let it rest in a baking dish. During this time, add the remaining beef stock mixture, along with the barbecue sauce to a large pot, and give this a good mix. Preheat your oven to 350 degrees. 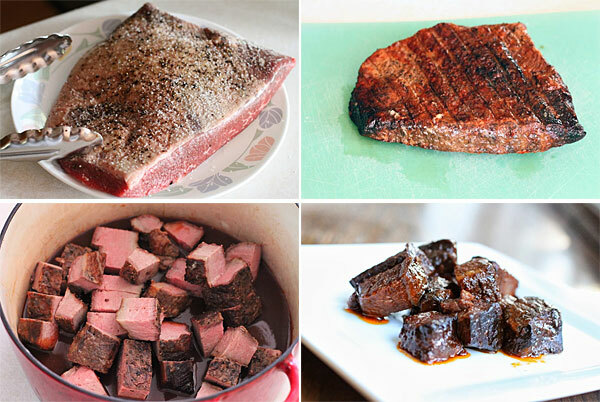 Once the brisket has cooked, but into bite sized cubes and toss into the sauce mixture. Cover and place into the preheated oven for one hour. Dig in. 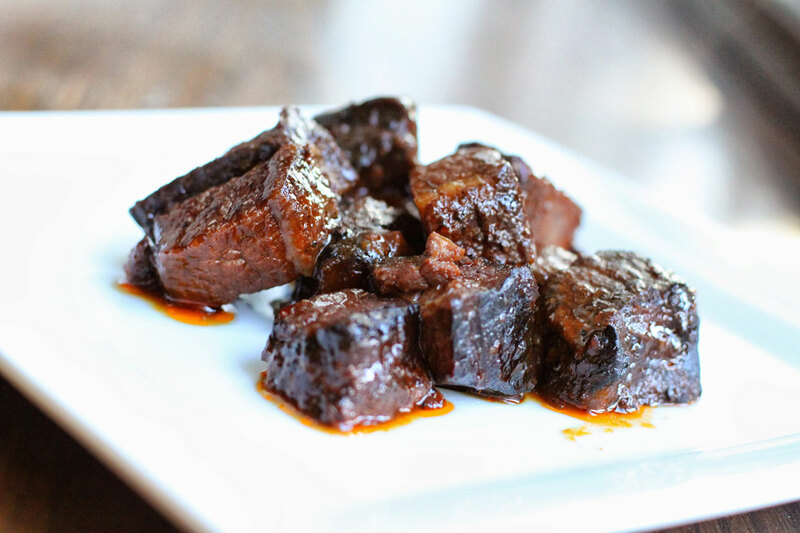 These burnt ends not only had a great smoke flavor but they were even more caramelized from the barbecue sauce mixture. So good, and so simple, you will probably want to repeat this process the following day. They go quick! I hope you enjoy. Cooking tomorrow. What temperature is the ideal smoker? 225 or 250? That temperature sounds just fine. Enjoy!